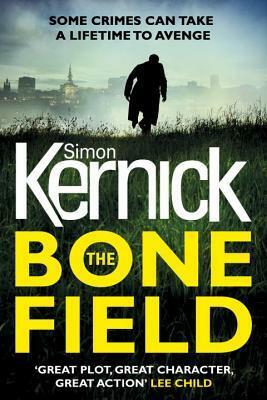 I read The Bone Field by Simon Kernick in December and thoroughly enjoyed it. It’s due to be published on 12 January. It’s the first of his books that I’ve read, but it won’t be the last. Kitty Sinn disappeared in 1990 whilst she was on holiday in Thailand with her boyfriend, Henry Forbes. There was no record that she ever left Thailand, but 26 years later her bones were discovered during building work on land that had formerly belonged to Medmenham College in Buckinghamshire. And then the bones of a schoolgirl who had gone missing in 1989 are found buried in the same field. There’s plenty of fast paced action moving the plot swiftly along, told through different characters’ viewpoints, mainly from DI Ray Mason, who is nearly killed when he goes to question Henry and then finds himself under investigation as a suspect. From then on he acts very much on his own, with the help of PI Tina Boyd, an ex-police detective. Both find themselves in danger as they are confronted by a gang of ruthless killers, ritualistic murderers and people traffickers. The Bone Field is the first in a new series of books, featuring Ray Mason and Tina Boyd, both of whom are the most developed and convincing of the characters and, I understand, are both characters from Kernick’s earlier books. I read the book quickly, drawn by all the twists and turns to the dramatic ending. However instead of tying up all the loose ends, the last sentence raises a new mystery, a partial cliff-hanger that, I assume, will lead on to the next book in the series. My thanks to Lovereading who sent me a copy of this book for review. Oh, I’m already intrigued, Margaret. I have to admit, I have a sort of weakness for stories like that, that link past and present. This one sounds very good, and I’m glad you enjoyed it. This is the second glowing review of this title that I’ve read in as many days. Must add it to my (shamefully long) TBR.